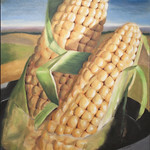 Home » Galleries » Past Shows » 2016-2017 » Center for Faith and Life » "Corn Portraits from Biblical Times to Present"
"Corn Portraits from Biblical Times to Present"
Dena Tollefson is an American artist whose bold contemporary oil paintings focus on the joyful use of color, texture and movement. 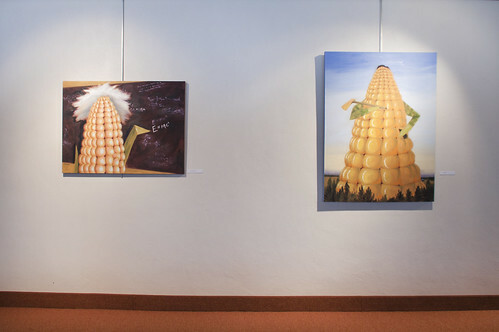 Among her many subjects, her imaginative Corn Series of work presents visual biographies of people as ears of corn, an apt metaphor for an artist working in Iowa. Tollefson is a prolific artist with an extensive list of exhibitions to her credit, from Florida to Arizona. 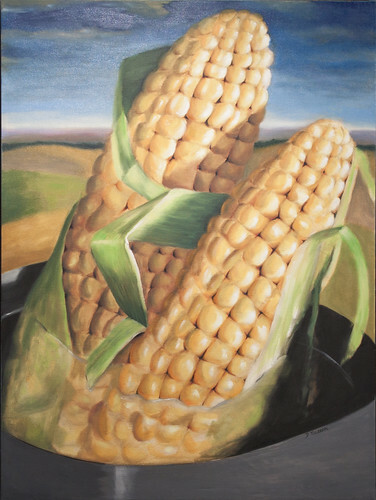 Her work can also be found in several institutional and corporate collections, including the Cedar Rapids Museum of Art, where one of her "corn portraits" is currently hanging in the newly re-installed Grant Wood and Marvin Cone Galleries. 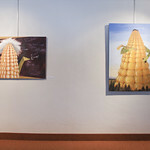 She is represented by galleries in New Mexico, Florida, Wisconsin, Illinois and Iowa. Tollefson earned her bachelor's degree from Iowa State University in 1988 and later did graduate work at the University of Iowa. She currently lives in Cedar Rapids, Iowa. More information is available at her personal website.